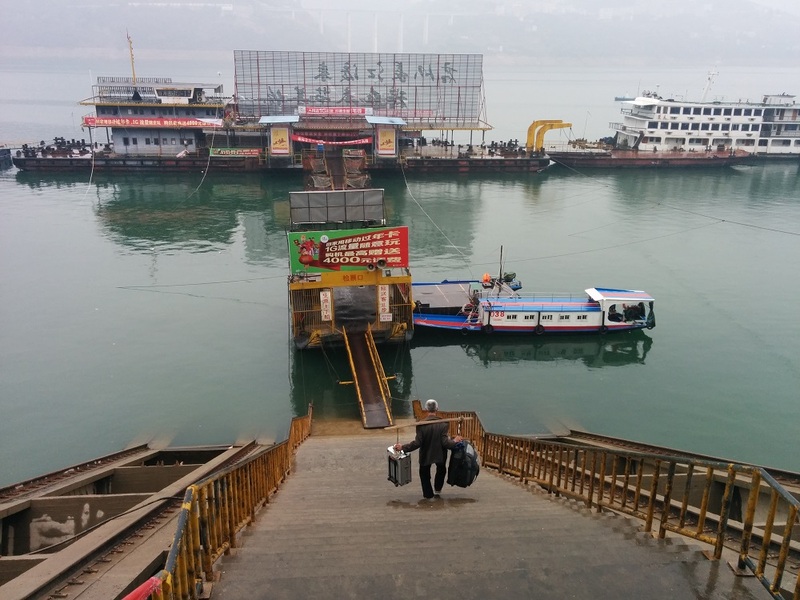 An older resettled man carries our bags to the hydrofoil at Fengjie on the Yangtze River, now part of the Three Gorges Dam reservoir. Many older resettlers are having difficulty finding regular employment. In late February I set off for Asia to visit government-led population resettlement programs associated with chronic flooding in Vietnam’s Mekong Delta and China’s Three Gorges Dam and South-North Water Transfer projects. My companion for the China portion of the trip was François Gemenne of Sciences Po and University of Versailles. With funding from the Alliance Program, we visited the region to explore how these programs may be harbingers of resettlement to come, under a changing climate. In reality, our journey began in 2010, when François, Marcia Castro of the Harvard School of Public Health and I organized a workshop at the Rockefeller Foundation’s Bellagio Center on climate change resettlement, convening experts in resettlement research, environmental migration, public health, and impact assessment. The result was a research plan and a Policy Forum article in Science, “Preparing for Resettlement Associated with Climate Change” (November 2011). Present at the workshop were Yan Tan, who wrote a book on Three Gorges Dam resettlement, and Shi Guoqing, who directs the National Resettlement Research Center at Hohai University in Nanjing, who described the massive scale of resettlement in China. Three Gorges Dam alone involved the displacement and resettlement of 1.3 million people. The South-North Water Transfer project, which aims to move water from rivers and reservoirs in the south through a massive canal system (actually three separate canals from east to west cutting through densely settled regions), will likely displace an equal number. Separate projects with CARE and United Nations University on climate change migration, which resulted in two reports (In Search of Shelter and Where the Rainfalls), had sparked my interest in the Mekong Delta region, which lies barely above sea level yet supports one-fifth of Vietnam’s population, a quarter of its GDP, and half its rice production. Floods in the 1990s and an especially devastating flood in 2000 prompted the government of Vietnam to begin moving populations away from the main stem of the Mekong and onto dykes and into “cluster resettlement sites” along roadways. While the connection between these resettlement projects and climate change is not direct (it rarely is), climate is definitely a contributing factor. For the Three Gorges Dam project, the developers boast that it reduces the equivalent of 100 million metric tons of carbon-dioxide emissions, and the project is important for flood control. Shanghai was affected by massive floods in 1998, an El Niño year, which added impetus to the development of Three Gorges Dam and also prompted tree planting campaigns. Thus the dam serves important mitigation and adaptation functions. The South-North Water Transfer project is in response to decreasing trends in rainfall in the north, which have severely constrained the water supply for large cities such as Tianjin and Beijing. It is intended to redress the disparities in water distribution between the humid South and arid and more populous North. Models of future precipitation are uncertain, and while some show increasing water availability in the North, this trend could be more than offset by population growth. The flooding of the Mekong is more complex, but can be tied to increases in rainfall extremes upstream in the basin (which can be partly traced to climate change) and to changes in land cover. (Dam development in Laos, Thailand and China will have the effect of attenuating flood impacts but reducing the flow of vital nutrients, and potentially choking off the supply of freshwater fluxes that are needed to flush distributaries and to reduce saltwater intrusion.) The flooding was devastating enough that river bank erosion increased dramatically and traditional stilt housing was destroyed. 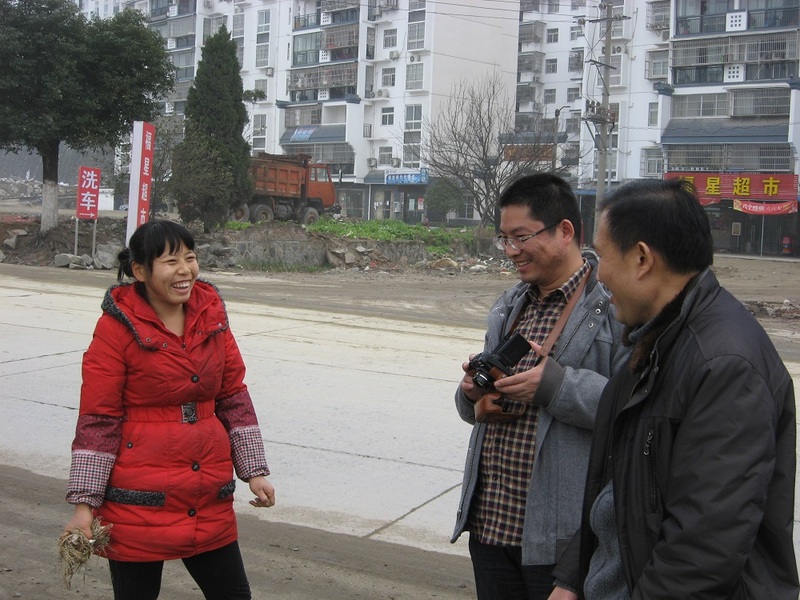 Our guide for the field visits to Three Gorges Dam and the South-North Water Transfer project resettlement areas was Ruishan Chen, a researcher at Hohai University and a former visiting scholar at the Center for International Earth Science Information Network, where I work. Starting in Chongqing, we took a bus to Fengjie over newly paved highways. From Fengjie we took a hydrofoil down the Yangtze, past stunning cliffs and isolated towns, to the terminus near the Three Gorges Dam, and from there we took a bus to Yichang. We were hosted by Professor Yuefang Duan of Three Gorges University. My trip to the Mekong was graciously organized by Sang Le Thanh of the Vietnam Academy of Social Sciences, who arranged for two junior colleagues, Vo Dao Chi and Nguyen Minh Phong, to take me out to Long An province, two hours southwest of Ho Chi Minh City. Near Three Gorges Dam, a resettled woman talks with Drs. Chen (left) and Duan (right), with resettlement apartments in the background. As anyone who has been to China can attest, the pace of development is dizzying, and everything is on a mammoth scale. Yichang, one of hundreds of small cities of ~1 million people, has benefited substantially from the Three Gorges Dam project, which has formed an economic growth pole in this formerly under-developed region. High rises and construction cranes dot the cityscape, barely visible through the perpetual smog. The next day we set out to visit the Three Gorges Dam itself (an impressive structure but not the primary target of our visit), and then drove through the county seat, which was completely relocated in the 1990s to make way for the dam. This city appeared to have several hundred thousand people. Our next stop was a community along the reservoir that had been relocated owing to the establishment of a large port facility that takes advantage of relatively cheap barge transport on the reservoir up to Chongqing. We spoke to a few resettlers, who had received apartments in return for their land, which was either submerged or taken up by the port. We also visited factories producing shoes and LED lights and displays where many resettlers work for the equivalent of about US$400 per month. The shoe factory provided free housing and one meal a day to workers. On our third day we traveled by high-speed train to Wuhan, Hubei Province, a city of 10.1 million, where we visited resettlement sites from a dam development on the Henan-Hubei border, the Danjiangkou Reservoir. The reservoir is the primary water supply for the middle route of the SNWT project (an eastern route will hug the coast and western route will connect the headwaters of the Yangtze to the Yellow River). More than 200,000 were displaced and relocated in urban areas. This kind of rural-to-urban resettlement has been China’s hallmark, and one which deviates from the traditional rural-to-rural resettlement of the past, where dam resettlers have been provided agricultural land in new areas in compensation for crop lands they have lost. Interestingly, the Danjiangkou resettlers were provided 0.1 hectare (one quarter acre) of land each on the outskirts of Wuhan and new two-story row houses. The vast majority prefer to rent their land for the sum of 1,300 Yuan (about $200) annually, and the younger people work in the factories. We spoke to two men over 50 who were unable to find work in the factories, so they work as day laborers in the city. One shrugged when asked if his circumstances had improved, while another seemed genuinely happy with his two-story row home with a spacious living room and flat panel TV. 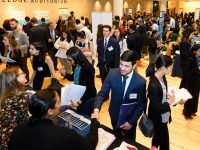 In conversations with our counterparts, we gleaned that many resettlers are economically better off than before the move, but that dislocations remain significant, especially for older resettlers, aged 50 plus, who have a harder time getting work in the newly developed industrial sector. Although the plight of some resettlers has been quite difficult (one older man competed fiercely to serve as a porter for us for the royal sum of $6), and there are stories of suicide in some resettler communities, it is hard to separate the problems they face from the larger dislocations that are so prevalent in 21st century China. 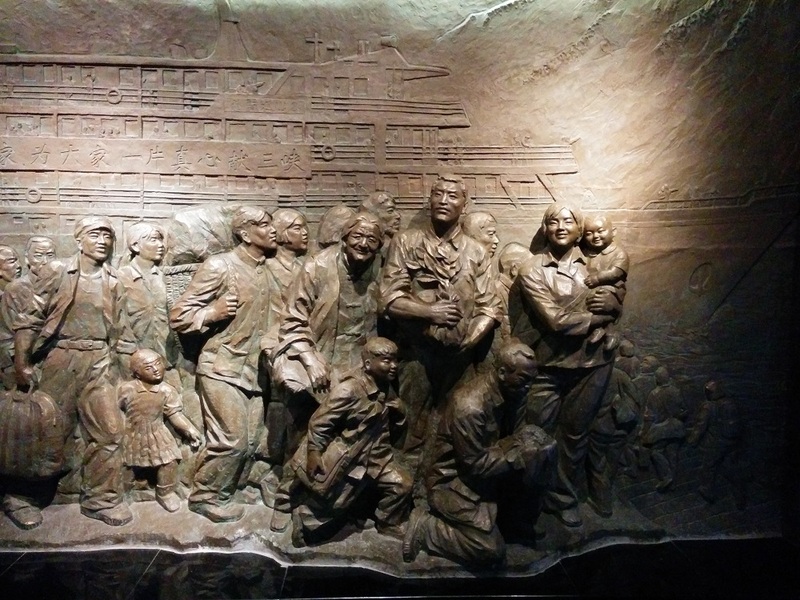 In Wuhan we had the impression that the resettlers were probably better off than the countless migrant workers from rural areas who receive no government assistance and are not granted residency permits (hukou). Yet the common response of farmers who are faced with resettlement is that they do not want to go. Ties to the land are strong, and the opportunities in distant cities seem fraught with risk. There is concern that the younger generation has become obsessed with materialism, an urban phenomenon, at the cost of tradition and community. On the other hand, the life of a farmer does not appeal to them, and many would have migrated to cities and towns regardless of the Three Gorges Dam or South-North Water Transfer projects. 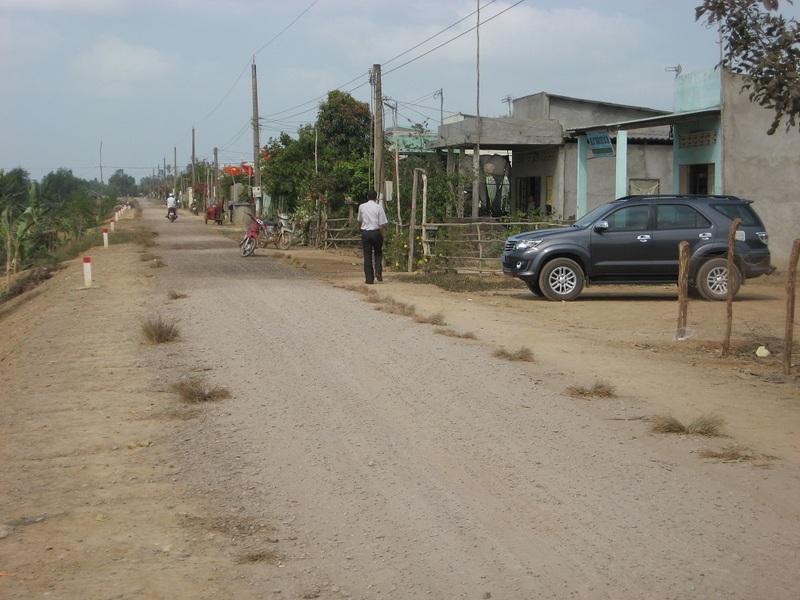 A resettlement dyke in Long An Province, Vietnam. 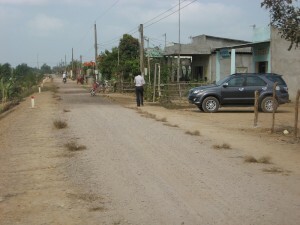 The community has a school, general store and electricity, with canals on both sides. Vietnam, like China, is facing rapid and disruptive economic change. Ho Chi Minh City is booming, and migrants from all over the Mekong Delta are flocking to informal settlements surrounding the city. Here, as in China, the farming life with its hard work and economic risks does not appeal to many in the younger generation. Resettlement areas here are intended to be close enough to fields for resettlers to travel to their fields during the dry season, but high enough that they can retreat to safety during the flooding season of October-November. Paradoxically, a strategy that seems intended to keep people on the land has, owing to the location of dykes and cluster resettlement areas near road networks, accelerated rural-urban migration. Yet cottage industries seem to be taking off among some resettlers, thanks to greater market access. The take home message for me, as it relates to resettlement and its connection to climate change, is “it’s complicated.” The Chinese government is often criticized for heavy-handed development interventions with little regard to local concerns. And this is true. Corruption and misallocation of funds for large projects such as Three Gorges Dam are rife and have been officially acknowledged by the government. In official versions of local history, resettlers are portrayed as “patriots” who selflessly sacrifice personal interests for the sake of the greater good (see photo below). All of this seems inevitably to provoke cynicism in the West. Yet, self-sacrifice for the larger good is part of the Confucian tradition. What’s more, there is a sense of inevitability in it all. One could well ask, What were the alternatives? China needs energy, and the wild running Yangtze, with its rapids and shallows, created problems for shipping from landlocked Chongqing, a burgeoning agglomeration of 30 million people. Then there were the massive floods that have affected downstream areas, partly attributable to climate extremes but mostly linked to land cover change. Mao Zedong envisaged the Three Gorges Dam, saying “Further upstream will stand a wall of concrete, and a placid lake emerges in the high rising gorges.” A plaque memorializing this quote states that Three Gorges has been “changed into a magnificent and imposing scenery, which rises straight up in Xiling Gorge, becoming a spectacle of world interest.” As early as 1914, Sun Yat Sen said it should be done. Could modern China back down from the vision cast by its greatest leaders? 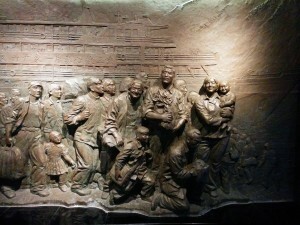 At the Three Gorges Museum in Chongqing, resettlers associated with the Three Gorges Dam project are portrayed as selfless patriots. In Vietnam, water flows in the delta are already heavily modified and engineered, but recent floods surpassed the design capacity. 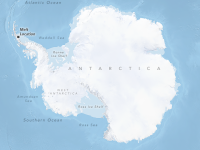 Sea level rise will pose new threats, but few locals seem aware or much concerned about the fact that some one-third of the delta’s land area is at risk of a 2 meter rise. While Vietnam is at an earlier stage of economic development than China, there are growing opportunities for those who leave the land. A number of the houses on the dyke resettlement area were closed up, with residents most likely keeping them as secondary residences from their new perch, however tenuous, in the city. Many landless were glad for the opportunity to have a concrete house at subsidized cost, though they are also saddled with loans that they only may be able to repay through work in the country’s emerging industrial sector. Although China’s and Vietnam’s models of resettlement are unlikely to be replicated in all their details by other countries (nor should they be), a world facing potentially dramatic ecological disruptions and changes in the habitability of large regions as a result of runaway climate change would do well to take note of how such efforts are planned and implemented, and to learn from their mistakes. the study was really great it emphasizes the impacts of floods and how to ease them.in Zimbabwe we had a situation like that also and this realy helped me to find ways on mitigating flood disasters as a development practioneer.